When I received my tube of Exuviance Triple Microdermabrasion Face Polish (buy here) They included in my package a few lovely samples, one of which I am sharing with you, today for Sample Saturday. Exuviance Intensive Eye Treatment Pads: Set of 12 Applications, $48.00 are made of angel wings. These pads are saturated with the good stuff, they mould to the contours of my face, perfectly and are cooling and comforting to have on my eye area as they are doing their thing. I left these on until they were pretty much dry then removed them. The skin under my eyes and on the tops of my cheekbones felt refreshed, smooth and silky soft and looked and felt firmer. My fine lines and baby crow's feet were softened and diminished. The effects lasted all day. These wonder pads did not irritate or sting my very sensitive eyes. I wish that the effects of these pads could last and last. And I want a case of boxes of these. They are so good! 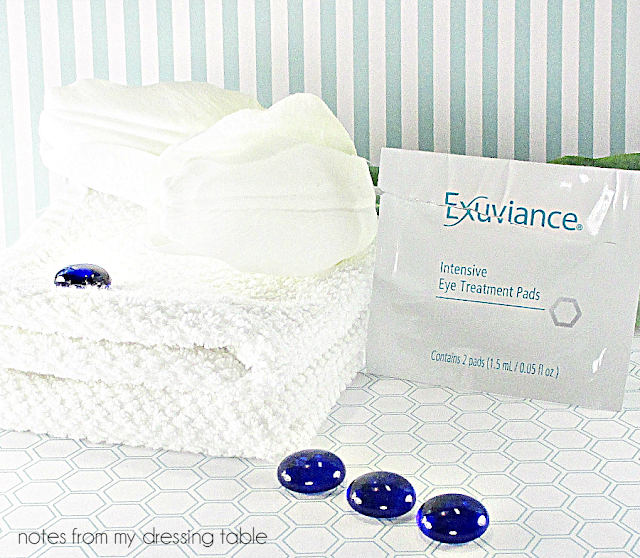 Have you tried the Exuviance Intensive Eye Treatment Pads? Would you give them a go? I am going to treat myself to a box, when my budget allows. I like them, that much. My eyes are the first place I noticed wrinkles so I am grabbing all the things to treat that! I flippin LOVE these things! I had a whole bunch of them a while back, and the effect actually sticks for a while if you use them regularly. I need to get enough that I can use them, consistently. It's so unfair that that is how it goes. They are good! I want cases and cases. I lurrrrrve eye treatment pads! I've tried the eye treatment pads I received in a PopSugar box, but wasn't very impressed. These look much better and I like that they are good for sensitive eyes. I do, now. And I need moar! I was surprised that my eyes were so happy with them, usually treatments like that hurt my eyes and I have to stop using them. Exuviance just makes good stuff.